I saw the Bag of Holding – Con-Survival Edition at ThinkGeek quite a few months ago, and wanted one of my own. 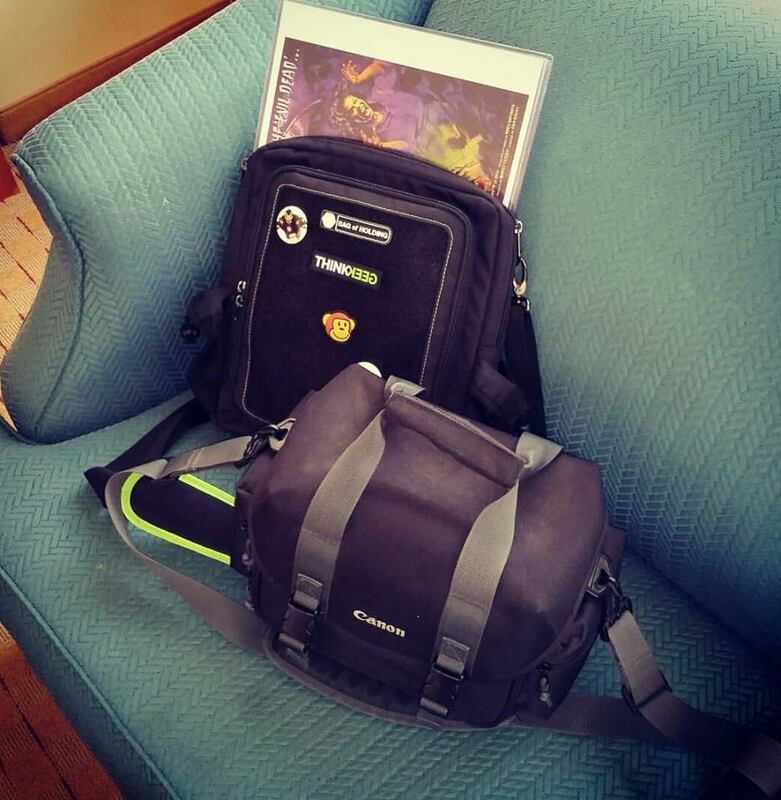 As an avid con attendee myself, I know the importance of a good bag for convention attending. So, I put my Con Bag of Holding to the test for Wizard World Chicago – a big con, with loads of people, a busy schedule for myself, and no room for errors. I will admit, I love the thought put into this bag. There are two mesh pockets on the sides of the bag, perfect to hold my water or soda bottles. One of the mesh pockets has an open bottom with a drawstring / toggle pull at the bottom so you can either close it, or – as I used it – you can slide a poster into the pocket and tighten the toggle pull and TH DAH! no accidentally sitting your poster down and wandering off without it. Granted, I did have a difficult time maneuvering with my posters, but I also had a long narrow box I was rolling my posters up and sliding them into. Because while the pocket can hold my posters – it can’t exactly protect them. But I had thought of this ahead of time. Another issue I had, and probably my only other real negative, was the pain in the rump of not being able to zip my bag when I had 11×17 prints in the bag (as seen above.) HOWEVER – I’ve never had a con bag I could zip and carry those in. Most of my frustration was related to the fact Wizard World didn’t give me a giant plastic bag with my VIP, which is what I was accustomed to. So, technically, this isn’t the fault of my Con Bag of Holding. Now, back to the positives! I definitely had more than enough room for my charger, wallet, maps, books, schedules, random small purchases, etc. And they didn’t all have to be clumped together, because of the large amount of pockets and whatnot. I knew where things were, could easily reach them, and didn’t have to pull over into a corner to awkwardly dump my bag out and figure out where my photo op schedule went. There is also a really nice pocket perfect for an iPad or other eReader type device, which I didn’t use. But hey, worth a mention. So, did I consider my bag worth buying? Yes. Will I be using it at all other cons I attend? Probably. Unless the situation requires a backpack. Check out the Bag of Holding – Con Survival Edition for yourself! Maybe it’ll become your go-to con bag. I’ll have a post up soon about Wizard World Chicago itself!